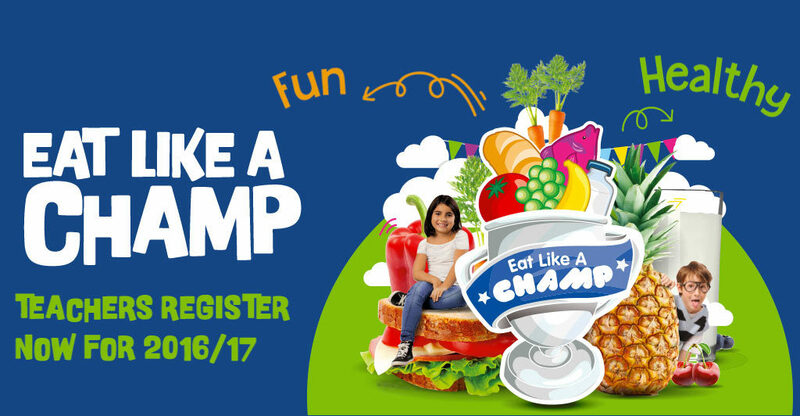 Eat Like A Champ is back for this school year with exciting new activities and fresh resources packs. Eat Like A Champ is a free, evidence-based healthy eating education programme aimed at primary school children aged 9-10 and with demonstrated results in shifting children’s behaviour towards healthier eating habits. It is run by teachers in their primary schools, over six specially tailored lessons in healthy eating, hydration and staying active. Since launching in 2010, Eat Like A Champ has reached 150,000 children and has ambitions to inspire 1 million children to adopt healthier eating habits by 2020. Following from Public Health England’s changes to the Eatwell Guide earlier this year, we have updated our resources accordingly to reflect the most recent government guidelines and links to the national curriculum. Our resources are also colourful, interactive and make learning about health exciting and inspiring for children. The first 3000 classes to register will be entitled to a free hard copy of our resources toolkit, delivered to their school. This contains a teacher’s booklet with lesson plans, a colourful homework passport for each child, posters, worksheets and reward stickers. Register online today to avoid disappointment! For those who miss out, these resources will also be available in a digital format on our website from the end of the month.